Winter break from Le Moyne is drawing to a close. I have really enjoyed this time to reflect and relax out here at the lake house. Living up here north of nowhere in Upstate New York is not for the faint of heart. It’s below zero much of the time during the mid-winter months. And for those of us who live here year round, each day is greeted with equal amounts of gratitude, caution, and awe. There’s a good-sized herd of deer living in the woods all around us. They know they are safe here. I swear they can read the “Wildlife Refuge” signs as easily as the read the “Deer Crossing” signs on the highway. They are fat and happy. I noticed that they are munching nightly on our English Ivy that lines the path down to the lake. When I first busted out of the woods onto a local farmer’s soybean field I finally got a sense of just how big the herd was. We see them all the time, but late at night it would appear, there is some serious deer partying going on. Tens of thousands of prints scattered all across dozens of acres. It’s a sight to behold. Die-hard ski whackos will appreciate this. Fresh snow is amazing. On that first day I never saw my ski tips. They just glided stealthily under the snow. It’s incredible to be the first human to break a trail. You can really make out every print in the snow. There is more traffic out there than you might imagine. Deer, fox, coyote, and lots of little critters making their merry way across hill and dale. They saw me coming, I’m sure, but very clearly left their fresh tracks in the snow. The trees rustle from time to time. There is an occasional hoot owl warning me not to venture too close. The hawks tend to stay near the open fields, but if you’ve ever seen one float their way through a tangle of branches, you would marvel at their technique. They are BIG… and quiet. Deer meander through the bush. 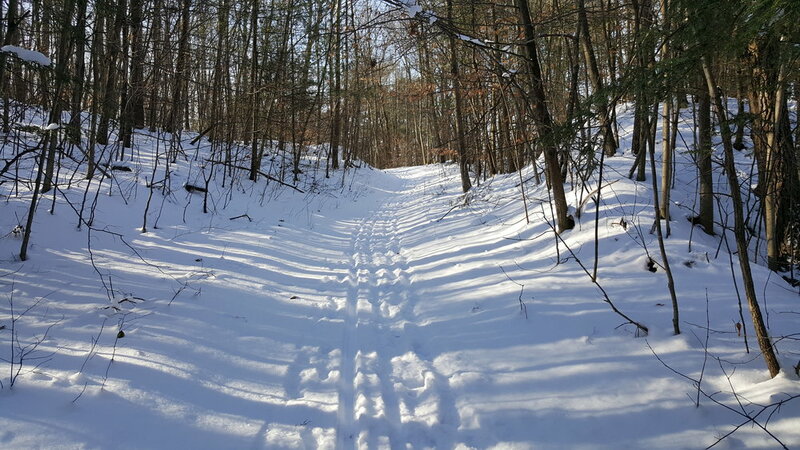 The trail is crisscrossed with their tracks. But, the big bucks just saunter right down the path. When you are the first human you can follow their tracks a long way. I suppose when you’re that big… (Yup, I could see how deep and wide their tracks were) you might be toting a pretty good rack. It’s just a lot easier to walk right down the trail. After a few days, my ski trail was crunched up pretty good with all kinds of traffic. But, I never saw another living soul, buck, or other. The solitude is breathtaking. But the adventure is awe inspiring. Yes, I love this country. I love its fields, the farms, the woods and streams. I love the pristine lake we live on, and the hardy folks who live up here in the wilderness. The beauty is everywhere. And I want this adventure to continue for as long as I can enjoy the ride.